What is a One-Serving Portion of a Fruit or Vegetable? Do you eat to the point of contentment, or do you eat until you need to open the top button of your pants to be comfortable? New research shows that routinely eating until you are stuffed may be detrimental to your health. Current findings demonstrate that people will over consume calories whether they are hungry or not. According to a survey conducted by the American Institute for Cancer Research, 69% of people will finish their meals, even when the portions are huge. In another study, published in the journal Appetite, subjects were offered various submarine sandwich sizes over four different days. The sizes of the sandwiches included 6-inch, 8-inch, 10-inch and 12-inch subs. The study found that when served the 12-inch sandwich women consumed 31% more calories and men consumed 56% more than compared to the 6-inch sandwich. Unfortunately, food sizes have increased dramatically without consumers even being aware. For example, a study published by the Journal of the American Dietetic Association showed that in 1955, a single order of French fries weighed 2.4 ounces while today; an average single serving is 7.1 ounces. This is nearly a 200% increase! Restaurants and fast food chains are also using catch phrases such as "two for one", "super-sized" and "all you can eat" to lure consumers. However, bigger is not always better. This trend must change. Numerous studies have demonstrated that an over consumption of calories can increase the risk of obesity (adults and children), type 2 diabetes (adults and children), cancer, heart disease and high cholesterol. In fact, a mild to moderate form of caloric restriction is one of the most powerful anti-aging steps an individual can take. Initially, decreasing your portion sizes takes some focus. It is important to remember that it takes 21 days to form a new habit, and food habits are no exception. Try implementing the following steps one by one to cut unwanted calories from your diet. Make your meals last at least twenty minutes. It takes this long for the stomach to send a "full" signal to the brain. Use your utensils to eat and put them down between bites. Doing so will automatically slow your eating habits. Avoid the super-sized menu items. More food usually translates into less health. Pay attention to your hunger signal. It is okay to let your stomach growl once in a while. In fact, doing so actually enhances digestion. Do not force a child to eat if he is not hungry. Doing so disassociates children from their true hunger signal. The parallel story also appeared on the ABC News web site and starts with a profound statement, "Though doctors are unsure of what causes blood pressure to increase, a new study suggests that a specific type of neck adjustment may reduce hypertension for some of the 65 million Americans battling it." The article referenced the University of Chicago study, published in the Journal of Human Hypertension, that showed that the patients in that study who received chiropractic adjustments saw their blood pressure drop an average of 17 points. The article quotes study author George Bakris MD, University of Chicago Medical Center hypertension specialist , "We set up a double-blind study to really look and see if in fact this procedure was affecting high blood pressure." The article and video notes that, "The C-1 vertebra, located at the top of the spine, operates like a fuse box in the body." Medical doctor and ABC medical consultant Tim Johnson was reserved in his reporting of the findings but was still impressed. He stated, "[There are] a lot of unanswered questions. But I'm telling you, this catches our attention because of a significant drop in blood pressure. It absolutely deserves more study." He continued, "The truth is we really don't know that vertebra at the top of the neck is in a critical area where the brain stem, the lower part of the brain, is involved with regulation of blood pressure. 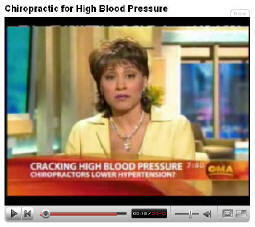 It's theoretically imaginable that changing the anatomy of that area may have an effect on regulating blood pressure." An occasional headache is an unpleasant nuisance, but a migraine brings everything to a screeching halt. While most remedies are drug- based, Dr. Smith has discovered a number of effective, natural solutions. Chiropractors and other health-care practitioners often recommend physical management of neck problems that cause migraines. In an extensive analysis of clinical trials, Harvard Medical School researchers compared results for physical therapy, massage and other non-drug options as remedies for headache. Outcomes showed that chiropractic adjustments helped with tension-type headaches that have migraine-like symptoms (Headache 2005;45:738-46). This type of care was found to be safe, with no serious adverse events, in a review of more than 19,000 patients (Spine 2007;32:2375-8). Your doctor of chiropractic may recommend that, as an adjunct to chiropractic adjustments, you consider other natural approaches. These may be particularly helpful for preventing migraines. Acupuncture, for one, has been proven to be a genuine migraine cure (Curr Treat Options Neurol 2008;10:20-9). Hypnosis, relaxation, skin-warming, biofeedback, endurance training and physical therapy have also been shown to work. Aromatherapy is also recommended, with applications of essential oils to the "pressure points" on the face and neck. Try oil of peppermint, marjoram and lavender. Resting in a dark room. Applying a cold compress to the forehead or back of the neck. Drinking fruit juice, especially tomato juice. Massaging the face, head, neck and shoulders. An interesting story appeared in the sports section of the February 15, 2008 issue of the Philadelphia Enquirer. The story titled, "Phillies getting Hamels his chiropractor," is about the Philadelphia Philly pitcher who requested his team get a team chiropractor. The team has agreed to add one to their staff. When informed that his team will be getting a chiropractor Hamels responded in the article, "Really? I've always thought it was beneficial. Ever since I've used one, it's done wonders for me. This is nice. It's great that they're going out of their way to get a network going. I know I do have a bunch of guys in a vast majority of the cities that I've been able to go to. If they're able to get those guys, that's great. But it doesn't matter. They're putting in the effort, which is good. I definitely can't complain." In response to Hamels' request, Phillies athletic trainer Scott Sheridan said, "That's the type of stuff you do every year. I certainly think that the players' needs change as the game goes on. We're going to go through times when you find a group of players that need one thing, and we have to provide it. Certainly, it's our job as the medical team and administration to adapt to our needs. I don't have any problems with chiropractic care. Cole and I have had open discussions about it. I'm trying to provide him something that can help him." The article notes that the Phillies hope to have a network of chiropractors in place when they are on the road. To accomplish this the Phillies have received help from the Philadelphia NFL football team, the Eagles, as the NFL already has a network of chiropractors in place for their players. The article notes that Hamels believes that not having chiropractic care played a role in his being on the DL (disabled list) last year. "It's a vast majority of things that I could have done to prevent it, but I know it (chiropractic) would have helped," he said. The article notes that Hamels thinks this year, with chiropractic, 20 wins is a very attainable goal.